We’ve gone behind the scenes at mannequin manufacturer Proportion>London, the company commissioned by the V&A to make 54 exhibition mannequins for Bowie’s clothes, to interview creative director and TWR reader Tanya Reynolds, to discover what it was like coming (almost) face to face with Bowie. Proportion produces mannequins for all the big museums around the world (it made the Savage Beauty ones for the Alexander McQueen show) from its East London workshop. Sculptor Rob Patterson worked alongside the V&A’s costume display specialist Lara Flecker to create the Bowie-sized mannequin. 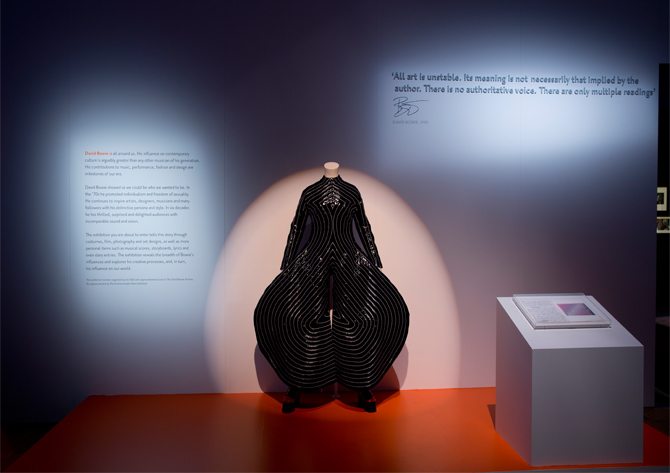 Toiles were produced of Bowie’s outfits to assist in the process honing the shape of the clay form, necessary to avoid putting stress on the delicate fabric of some of Bowie’s more spectacular outfits. 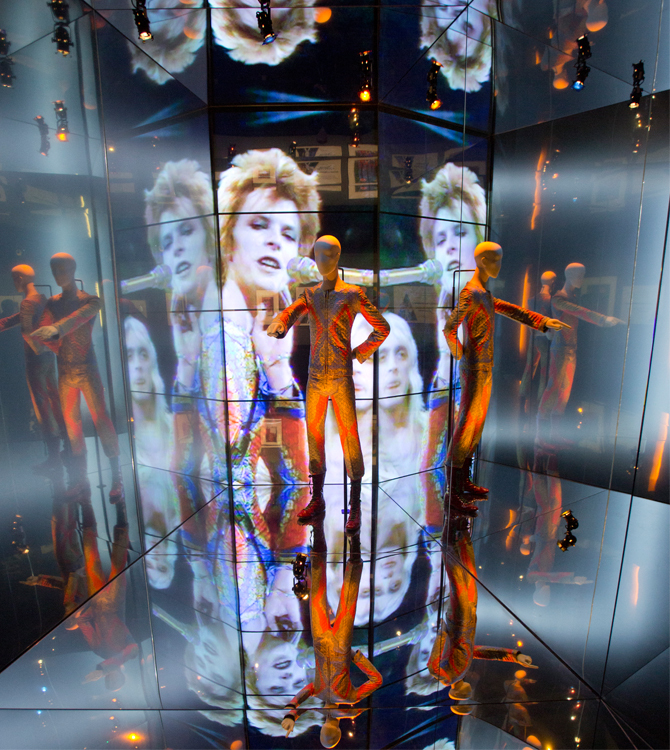 The team also worked from a life-cast of Bowie’s face, used to create a mask mounted over the mannequin’s facial features, which reinforced the projection of Bowie’s multi-imaged persona for each of the display sets. Stances such as the crouching figure above, wearing the knitted asymmetric Ziggy Stardust bodysuit from 1972 were particularly difficult, Proportion’s head technician Sam Hoye had to construct a wire arm in order to assemble the figure without damaging the costume . 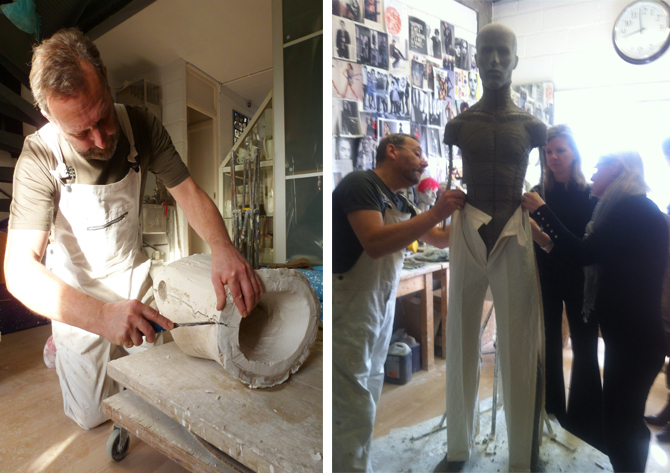 It’s fascinating to get a glimpse into the mannequin-making world, so Tanya…. 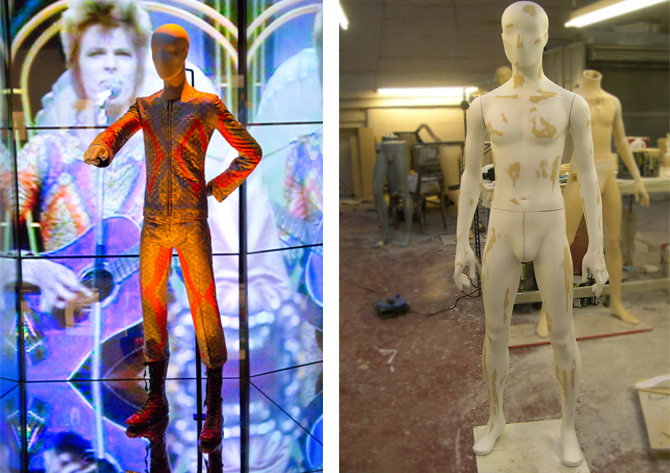 What did it feel like to develop a mannequin for showcasing Bowies costumes? When you get to deal with mannequins every working day, it can become a pretty mundane thing – this aside it was pretty awesome to discover how diminutive Bowie actually was. 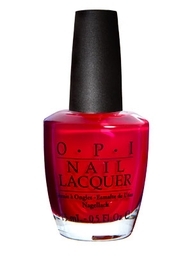 That overpowering strength of style seems very fragile when presented up close. Even more amazing for me was the face cast which we worked with – even looking at the inside, I was blown away that I was right up close to what appeared to be Bowie’s face! The mannequin looks absolutely tiny, just how skinny WAS Bowie? 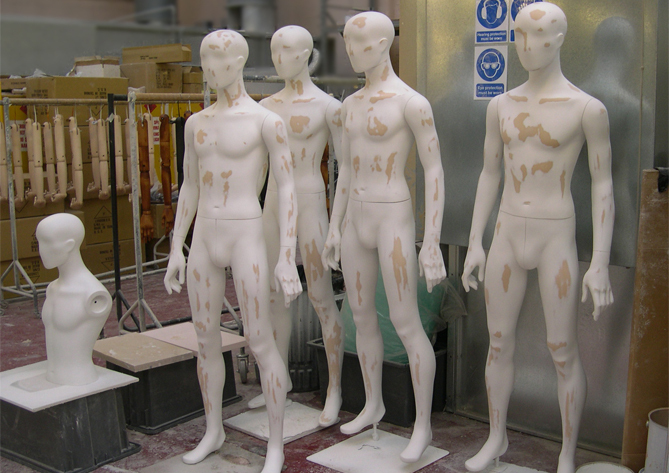 The mannequin was sculpted to fit the dimensions of some of his early stage costumes. The waist on the smallest was 26½ “. That seems small, but back in the day, when nutrition was not what it is today – it was quite common for young men to be this lean. I am often struck at how slim people were in the 70s when I browse through racks in vintage stores. Both Jane and I loved the exhibition because Bowie meant so much to us growing up, how did you and the sculptors feel about carving someone so close to their own musical youth? Did they play his music while they worked? I often play his music whilst I work! Actually, like you. I’m a big fan of Bowie’s style and music – particularly up to Ashes to Ashes. I can totally see how obsessive the fans of any big icon get – I found myself drawn to the workshop every time I went over to the factory and couldn’t help popping in, incase there was another photo opportunity. 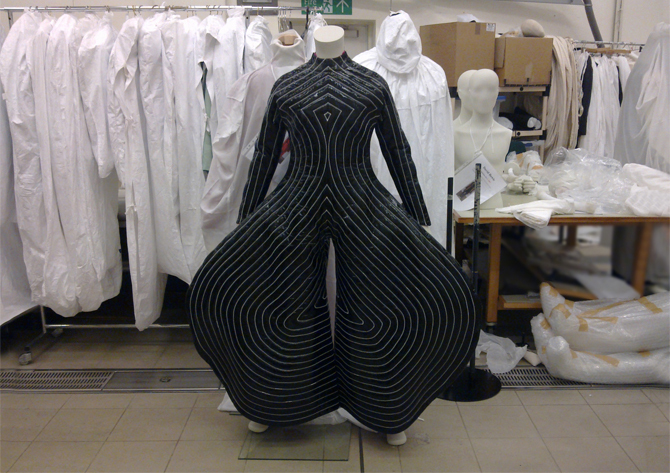 The toiles that the V&A made for us to use to fit on the figures were particularly interesting. I never realised how many I knew off by heart – even though they were all made in cream calico. Do you think you will be selling the Bowie style mannequins to Topman anytime soon? The figures that we sculpted for the V&A exhibition are exclusive to them – the moulds are held at our factory and would never be used for commercial production. Neither could I imagine that Topman would want a 26½” waist mannequin. 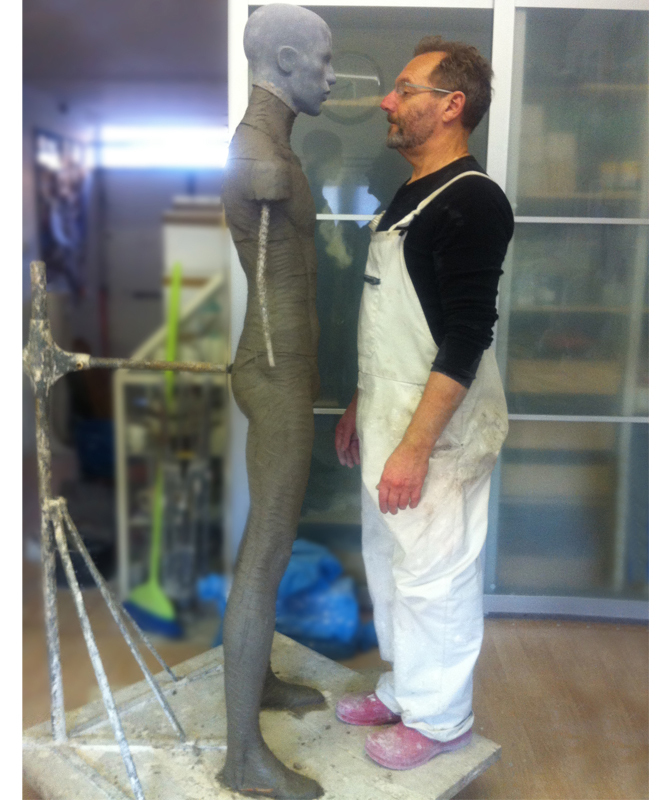 However the starting point was our own METROpolitan mannequin collection – from which we took the style of the sculpt. This has a 28” waist at narrowest and has graced the windows of (amongst others), Selfridges and recently launched menswear brand Hunter Gather. Lean mens silhouettes have been around since Hedi Slimane popularised pin thin suiting a decade ago. 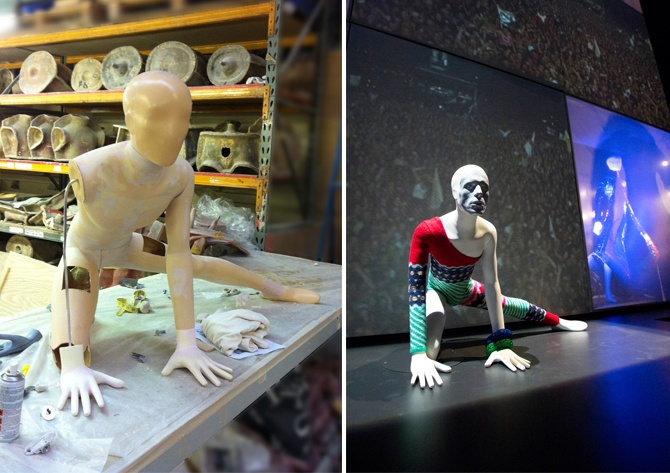 Above is the Kansai Yamamoto body suit in the Proportion>London studio for its final tweaking and below is the finished installation at the V&A show. The Bowie exhibition is on at the V&A until mid August, but you’ll need to book tickets before you go. Amazing look back stage – thank you! I am going in July to see the exhibition and I am sure it will back many memories of a mis-spent youth and going to a concert at I think Earls Court with very carefully applied Ziggy flashes across our faces – happy times ! Can you imagin – my children would have me locked up!